Yesterday, state legislative leaders unveiled a joint budget deal that again puts North Carolina on the wrong track by pursuing deeper tax cuts at the expense of strengthening public education, public health and safety, and the other building blocks of a strong economy. 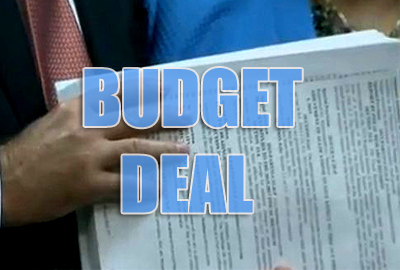 The deal includes another costly round of income tax cuts, additional tax breaks for selected industries and an expansion in the sales tax base to include installation, repair, and maintenance services. The tax plan will cause a revenue decline of $383.6 million over a two-year period, with the annual loss ballooning to $692.9 million in by the fifth year. The state Senate is scheduled to give preliminary approval to the 400-plus page deal today and final approval tomorrow, despite its extremely late (11:30 p.m. last night) release. The House is expected to vote on the deal as early as Thursday, with it headed to the Governor’s desk after a final vote. The stop-gap spending measure that is currently in place expires Friday at midnight and would need to be extended for a fourth time if a final budget deal is not in place by then. While most of the public budget debate this week will be on the spending side, examining how lawmakers pay for the budget deal is just as important. This is especially true due to this new round of costly tax cuts that come on top of the $1 billion in annual tax cuts approved two years ago. Both tax plans drain resources that otherwise could have been used to build opportunity and replace the worst cuts enacted since the economic downturn. Revenues came in above projections by $445.8 million for the 2015 fiscal year. And, leadership has access to nearly $417.7 million in unspent money that is expected to be left “on the table” at the end of the current fiscal year. They also have an additional $2 million due to the Dorothy Dix property sale but that is offset by an already-approved tax change that costs the state $1 million. Lawmakers used 70 percent of the over-collections and unspent money to boost the state’s main savings account and the savings account dedicated to repairs and renovations of state properties. This is a good decision because it is increasingly clear that the FY15 surplus is one-time in nature. Leadership carries over the remaining $264.5 million into the upcoming budget cycle (more than what they’ve done in the past couple of years). These dollars should only be used for one-time expenses because it is one-time money. Most of the revenues will come from taxes, primarily from the state income tax, sales tax, and corporate income tax. The remaining revenue comes from the Highway Fund and other non-tax sources. (The Highway Fund transfer is repealed; see below). The revenue total is diminished by approximately $1 billion per year as a result of the tax plan that lawmakers enacted in 2013—the benefits of which primarily flow to wealthy individuals and profitable corporations. The total also includes the latest rate reduction to the corporate income tax, which will be lowered from 5 to 3 percent by 2017, costing $109.1 million in FY16 and $349.1 million in FY17. Lawmakers should have eliminated—or at least delayed—this tax break until revenues recover to the level that’s needed to adequately fund education, public health, and other vital public services. The budget proposal includes major tax changes that reduce revenue while also diverting one-time money that is available (or left over) from special funds to help plug the hole. The final budget reduces revenue availability by $587.6 million over the biennium by including another costly round of income tax cuts, tax changes for corporations and renewing the Historic Preservation Tax Credit that was scheduled to expire. The cost of these tax cuts is partially offset by expanding the sales tax base to include installation, repair and maintenance services—this move raises $204 million over the biennium for the state. Any shift in the sales tax base should be paired with a state Earned Income Tax Credit to provide targeted and efficient relief to low- and moderate-income families but the budget fails to include this credit. Budget writers also force local governments to set aside $17.6 million in FY17 from local sales tax collections (which are raised from the sales tax base expansion) and target those dollars to public schools, community colleges, and economic development. There is a related special provision that would change the sales tax allocation among the state’s 100 counties for new tax collections collected under the expanded sales tax base. The proposal also reduces General Fund availability by ending the $215.9 million transfer from the Highway Fund that supported the State Highway Patrol, by transferring $10 million each year to the Golden Leaf Foundation from the Master Settlement Agreement and setting aside $75 million in FY16 and $150 million in FY17 for Medicaid reform. It boosts General Fund availability by $18.9 million by using transfers—for example, from the Treasurer’s Office and funds forfeited from flexible spending accounts—and anticipates another $44.4 million by transferring judicial fees and accepting settlement funds from a lawsuit against credit rating agency Standard and Poor. On net, the leadership reduces General Fund availability by $312.3 million in FY16 and more than double the losses to $713.4 million in FY17. This price will further balloon with each year as the income tax cuts phase in, limiting future budget writers’ ability to craft an adequate budget. In addition, the budget also substantially hikes DMV and other transportation fees and taxes by $292.7 million that aren’t sent back to the General Fund and thus do not show up in the summary chart below. 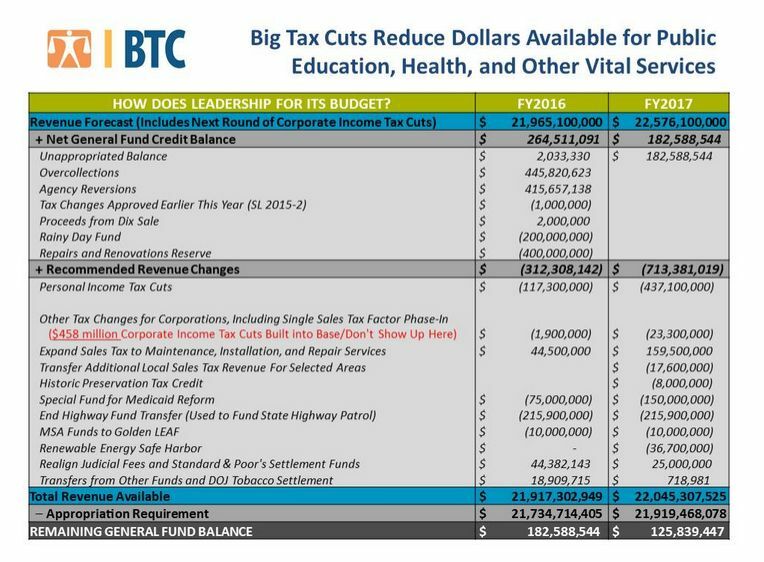 In the end, the leadership leaves nearly $182.6 million on the table in FY16 and $125.8 million on the table in FY17 that can be carried over into the next budget cycle. See the chart below for a summary. “North Carolina leaders have missed another opportunity to build an economy that works for everyone. Rather than making the truly tough choices that reflect the priorities of North Carolinians, policymakers have once again decided to cut taxes and forgo critical investments that boost the economy. Such investments include providing every child with a sound education; bolstering the public sector foundation that supports innovation, builds opportunities for research and development, and trains workers; and protecting the health and well-being of our state’s residents and communities. Next article Crucial Conversation — For-profit colleges: A helpful solution or part of what ails higher education?